Tim from the Belgian Mare Brewery in sunny East Alstead, New Hampshire, takes you through a video tasting of several of his more popular beers. Hi all, Tim here from the Belgian Mare Brewery. Coming to you from what is really sunny East Alstead, New Hampshire. Spring is here and the snow is gone. We are opening the tasting room for the 2018 season on May 6th (2018) from 11-4. This has been been our usual hours until end of November for several years now. We have something new on our shelves here. Right now we have the Snoring Mastiff named after our old pal Big Banana. Many of you have already met our dog. And just like Big Banana this beer is really easy going. This is a traditional stout which is a little bit lower in alcohol, but has huge, huge flavor. There's tons of chocolate wheat malt in there. So it has that real strong roasted malt flavor. You really got to check it out. We have our mugs available too, handmade from Wisconsin. 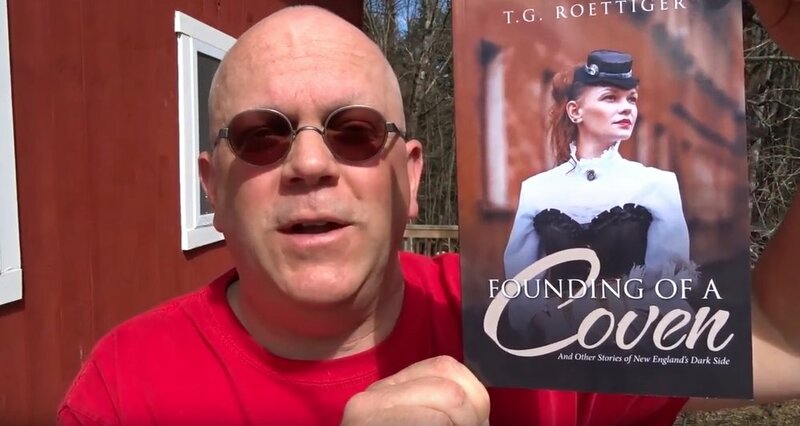 And in the shameless plug department, I have my book “Founding of a Coven”. It's still holding onto to its 5-star rating on Amazon. Which is awesome. We have signed copies here and if you want a dedication, I can do that too. Also you get copies in Keene, NH or Peterborough, NH at the Toadstool Bookshop or order on Amazon.com. Coming up in the future we have a Peach Saison down in the cellar bubbling away and it tastes awesome. The gravity is still high and it's going to need some time to condition. So that's still in the future. So come on out. If you can't find our beers at your favorite retailer. Have them give us a call. We're always looking for new retailers. But remember, Sunday May 6th from 11-4 our tasting room is open. Free samples as always. We hope to see you soon. ALWAYS BOTTLE-CONDITIONED AND ONLY AVAILABLE IN NEW HAMPSHIRE. THAT'S THE BELGIAN MARE BREWERY. WE HOPE TO SEE YOU SOON. 25 Year Old Beer — "That's a good beer." Okay. Hi all all this is Tim from Belgian Mare Brewery in sunny East Alstead, New Hampshire. Today I am out on vacation and I am back in Wisconsin at my parent's house. What we have here is the last known bottle of the very first beer I brewed 25 years ago. This is the last time I am going to be able to do this. We are going to up this up and see what happens. We have some carbonation. Okay. If I recall correctly they were a little bit foamy. Yeah. Not bad. A little darker than I recall. This was supposed to be a Canadian Lager kit. It should have a carmelly aroma. And here's the moment of truth. [Tim takes a sip] Not bad! Whew! That held up. That's a pretty good beer folks. Twenty five years, it's the last one we have left. I guess who says you can't age a beer. [takes a big sip] Hmmmmm. That's a good beer. Thank you. A real classic Pale Ale. Our most popular beer! Our Pale Ale is more of a traditional British Pale Ale. Has a Goldings hops, crystal malt, and makes for a very smooth, easy drinking kind of beer. Anyone can enjoy it and goes with any type of food out there. Right off you catch that little bit of fruity aroma from the traditional yeast, then the warm spicy character of the Goldings hop. Enjoy this video tasting review of the first beer Belgian Mare Brewery produced — Hemlock Stout. Along the lines of a British mile ale, Alsteadder Ale, is named after our own town. A nice golden ale with a little bit of a white head on top. Very tasty and at the same time very smooth.